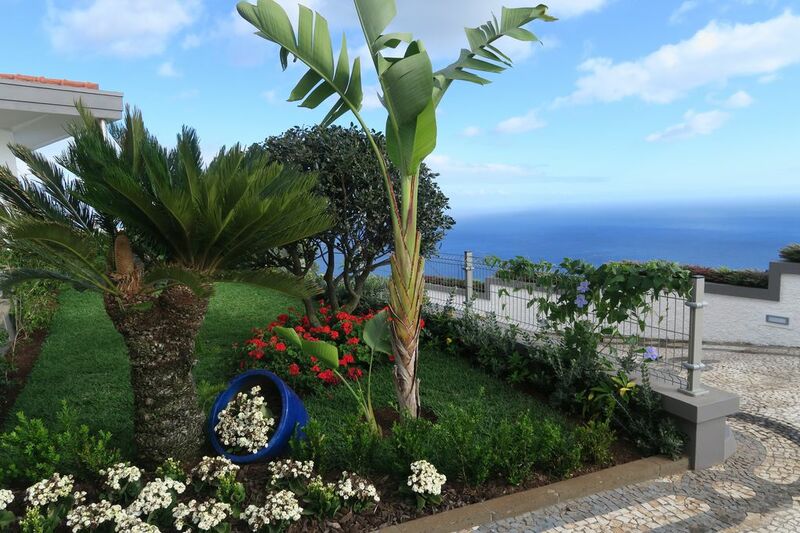 This spacious penthouse villa in the village of Garajau, Canico, enjoys a beautiful sea view 180 ° from Funchal to Desertas Islands. The living room has a flat screen TV, a stereo, an Xbox 360, a collection of DVDs and boasts a contemporary decor. It opens onto a large terrace. The first bedroom with ensuite bathroom has cupboards, desk and its own terrace with sea view. The second bedroom with en-suite bathroom has a separate dressing room. The kitchen is equipped with an oven, a microwave, refrigerator, freezer and dishwasher . ; kettle, toaster, coffee machine. The laundry room has a washing machine, a dryer, ironing board and iron steam plant. Heated private pool (price below) with large sound park, bathroom with shower and pool furniture. The village of Garajau with its cafes and restaurants, shops (bakeries, pharmacies, dry cleaners, grocers, florists etc.) is 5 minutes walk. Two large supermarkets are within a two minute drive. A 5-minute drive from the beach Garajau renowned dive site is accessible by cable car. Palheiro Golf is 6 kilometers by car and that of Santo da Serra (PGA course) to 20 minutes. This spacious penthouse villa in Garajau enjoys glorious 180 ° uninterrupted sea views from Funchal to the Desertas Islands. The large tastefully furnished living area is equipped with flat screen TV, sound system, Xbox 360 and a DVD library. It opens onto a vast terrace. The first double suite bedroom fitted wardrobes HAS wide, a writing-desk and Its own terrace with sea view. The second double bedroom boasts result has separate dressing room. The well-equipped modern kitchen: has a traditional oven, microwave, fridge freezer and dishwasher, toaster, sandwich toaster, kettle, coffee maker. The laundry room is equipped with a washing machine, tumble dryer, ironing board and steam generator iron station. Private heated pool with large sun terrace with sound system, bathroom with shower and pool furniture. Garajau ict town with cafes, restaurants, shops (bakeries, pharmacy, dry cleaner, grocer, florist etc) are 5 minutes on foot. Two broad supermarkets are a two minute drive away ..
Garajau beach resort, renowned for scuba diving, is just a five minute drive and can be atteint by cable car. Palheiro golf and gardens is a 6 kilometers drive and Santo da Serra (PGA course) is a 20 minutes drive. This villa really does have everything - the views are incredible; it had everything we needed (&more); it’s within easy reach of everywhere we wanted to go & the owners couldn’t have done more to make our holiday so wonderful. We will most definitely be back! Thank you for having us. So glad you enjoyed your stay. We very much enjoyed meeting you both and of course the lovely, so well-behaved Evelyn. We're so please you enjoyed your stay with us. We hope to see you again...after your next trip to .....Costa Rica?? We had an end to end perfect stay in this luxury villa - the best place we have stayed on the island. Spotless and very well equipped. We were made so very welcome by the owners, who were a pleasure to meet and so attentive whilst giving you all the privacy you would expect. The views? I can't find the words to describe and the photos do not do this justice!! Even on a cloudy day it's magnificent!! We have found our perfect home from home stay and made some really good friends to boot, we will be back as soon as we can. What can we say? You were the perfect guests! We're so pleased you enjoyed your stay and look forward, eagerly, to seeing you again for another marathon chinwag. Be safe and hope all goes well for your new "adventure" in a fortnight...All the best to you both. Cecilia & Jean-Paul, wir freuen uns auf ein Wiedersehen, wir hatten eine super Zeit in ihrem Haus. Excellent séjour dans cette île aux mille variétés ! Dans une villa "prémium" avec tout le confort (moderne) souhaité, piscine chauffée à l'appui. Les propriétaires sont réellement charmants. De plus, en milieu de semaine, ils nous ont invités à passer une très agréable soirée chez eux. Soirée des plus sympathiques ! Je recommande la location de leur voiture : pas d'attente à l'aéroport, le propriétaire vient nous chercher à l'arrivée, et au départ de l'île. Et cette voiture est assez puissante pour les côtes impressionnantes qui ne manquent pas...!! Un seul regret, un peu plus de soleil aurait été le nec plus ultra de cette semaine merveilleuse passée sur cette si belle île !! A faire, sans détour !